“I would rather sit on a pumpkin, and have it all to myself, than be crowded on a velvet cushion,” wrote David Thoreau in Walden. This weekend is kind of similar. There might be a lull before BlizzCon 2016, and less action than usual in the fighting game community, but the final act of Worlds 2016 is just about to be written. Find out where and when to watch everything from League of Legends to Rocket League below. Last night, upstarts ROX Tigers fell to veterans SK Telecom T1 in a valiant 3-2 nail-biter of a series, proving once again that the throne of Lee “Faker” Sang-hyeok is no so easily usurped. Today, the League of Legends World Championship continues with the conclusion of the semifinals as Europe’s H2K takes on Samsung Galaxy later today at 6:00PM EDT. The winner will go on to face two time champions SKT in the Grand Finals at approximately 7:30PM EDT next Saturday, October 29. You can watch today’s best-of-five series, as well as rebroadcasts of previous matches, here. ELEAGUE Season 2 continues today in with Immortals.cs up against FaZe Clan today at 2:00PM EDT. You can watch that game here. The Epicenter 2016 tournament is also going on in Europe this weekend, with semi-finals beginning tomorrow at 5:00AM EDT between Virtus.pro and SK Gaming. 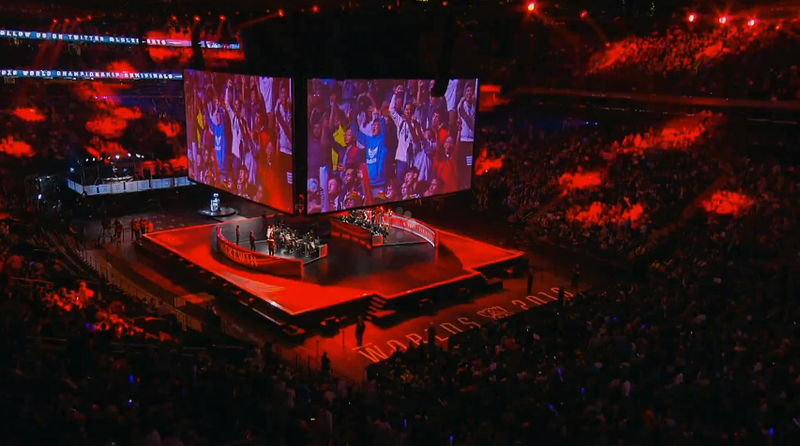 The finals will follow at 11:00AM EDT that same day, worth a total of $250,000 to the winner. You can find all that action right here. This weekend things settle down a little with two ranking events. The first is the FV Cup in Malaysia, followed by an online tournament for Asia-Oceania. Matches continue late today starting at 11:00PM EDT and running through the night. The Grand Finals should begin around 3:00AM EDT Sunday morning. Top players in attendance include Ryan Heart, Ryota “Kazunoko” Inoue, and Kun Xian Ho. You can watch those matches here here. Qualifiers for the Dota Pit League Season 5 continue this weekend with Team Liquid going up against FlipSid3. at 11:00AM EDT today followed by Team Secret playing at 2:00PM EDT. You can watch those games here. Regular league play for the Rocket League Championship Series Season 2 continues this weekend with North American teams playing on Saturday beginning at 3:00PM EDT, followed by matches for Europe on Sunday at 12:00PM EDT. You can watch them below. The European Challenger Cup continues this weekend culminating in the finals on Sunday to see who will get a shot at the next SMITE World Championship. Watch those games here. The Americas WESG finals take place today, with 12 players gunning for a piece of the $27,000 prize pool and, more importantly, qualification for the WESG Grand Finals and its prize pool of $300,000. You can find those games, currently going on now,right here. The Carbon Masters event continues this weekend. Teams like Immortals and FaZe OW will compete over a prize pool of $7,500, with the action starting tomorrow at 3:00PM EDT. Matches can be streamed live here. And last, but certainly not least, is the Gears of War 4 MLG Invitational in Columbus, Ohio. Games begin today at 12:00PM EDT, with the Grand Finals taking place around 6:00PM EDT Sunday evening. Eight teams will be competing for a piece of the $25,000 prize pool. You can watch all of it right here.